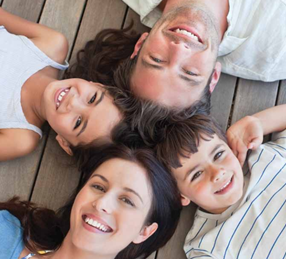 Modern Heating and Plumbing can keep your family and home comfortable, no matter what the weather is doing outside! Modern Heating and Plumbing can help you make the best plumbing choices for your home or business. Whether you live in a new or old home, one of the most serious problems facing homeowners today is poor indoor air quality. We have experience, problem solving and excellent staff. Modern Heating and Plumbing, serving our Lakes area for over 55 years, was established in 1947. Rick and Kathy Michaelson, owners and managers, bought Modern Heating and Plumbing in 1981. As your full service mechanical contractor, Modern Heating and Plumbing employs 16 full time licensed installers and technicians. Dedicated to our clients, Modern Heating and Plumbing is a full service mechanical contractor, specializing in home comfort and living environments. We offer a trained, experienced, and conscientious staff; superior products and prompt installations. Every project, every warranty, every issue, will be handled with the utmost integrity, insuring customer care and satisfaction. This time of year, just makes a person smile! Snow is melted, lakes and ponds are opening, birds are singing, sun is shining and of course we are welcoming back our valued “snow birds.” It is also the time of year that we begin to think about spring and summer maintenance. Whether you need your cooling system serviced, your home primed up, a broken/leaking outside hydrant replaced, need a quality water conditioning system, need your air conditioning system replaced or maybe you need to install a heating and cooling system, our trained and licensed technicians can take care of it all! Navien’s Condensing Combi Gas Boiler/Water Heaters are the ideal solution for home owners who need both domestic hot water and a space heating application. Unlike conventional boilers, Navien’s Combi heats water only when needed making it environmentally sound and cost efficient. To help explain “condensing technology,” imagine the condensation on a glass of ice water. This condensation is created inside Navien’s condensing heat exchanger (secondary exchanger) from the incoming cold water cooling the hot gases inside the unit. Navien’s stainless steel, condensing heat exchanger then traps this condensation and uses it, making the whole process incredibly efficient and economical. Normally this condensation would escape through the vents in a conventional water heater Navien’s Combi Water Heaters reuse the condensation, providing you with the most efficient Combi Water Heater on the market today. Navien’s Combi features low cost PVC venting; extended life with stainless steel heat exchangers; eco-friendly, pre-mixed burner; built-in CO monitoring; automatic water fill for space heating lines and a built in control system to keep the unit’s plumbing frost free. What is the Lyric? The Honeywell Lyric is a Wi-Fi connected platform that is designed to simplify home comfort, security and awareness by controlling connected home products with a single app. Did you know the average water leak causes $7000 in damage? With the Lyric, you can be noti ed of a water leak, when it is measured in drips instead of gallons. The Lyric also detects low temperatures in your home, which can cause freezing and break- ing of pipes and damage to your home. Noti cation messages can alert you or your family wherever you are…at home or on vacation. 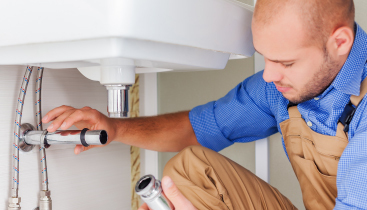 Place the Lyric near sinks, washers, water heaters, sump pumps…wherever leaks could happen. The battery life in the Lyric lasts up to three years without incident. The Lyric device is reusable even after detecting an incident. To have a Lyric installed, “For Your Family’s Comfort”, call us at 847 7542 or stop by our of ce at 18550 Hwy 59 North in Detroit Lakes. 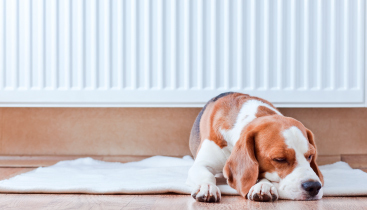 If you’re shopping for an entire HVAC system, an air conditioner, a furnace or heat pump RUUD equipment can give you total home comfort and peace of mind. Many questions come to mind when choosing your new equipment. How do you choose the right HVAC system; What is the difference between an air conditioner and heat pump; How do you know what you need; How do you nd a reputable installer? Whether you need a single piece of equipment or an entire system, RUUD products are quiet, ef cient, durable, low in service needs and have great warranties. Cooling equipment, which can be an air conditioner or heat pump (which cools and heats) needs to be sized properly. A unit which is sized too small will run continually and never cool your home to a comfortable temperature. A unit sized too large will not run long enough, as it cools the home too quickly and shuts off, so the humidity is not removed from your home…consequently, you still don’t feel comfortable. RUUD cooling equipment is quiet as they contain Scroll compressors. Scroll compressors are the leader in reliability, ef ciency and quiet operation. The outside condensing units have powder painted cabinets with high quality enamel to provide durability while sitting outside in the elements. RUUD cooling equipment is also a leader in ef ciency with SEER ratings (Seasonal Energy Ef ciency Ratings) of as high as 18! Many cooling units only have SEER ratings of 13. Heat pumps, since they cool and heat, are rated with an HSPF (Heating Seasonal Performance Factor) ef ciency rating. 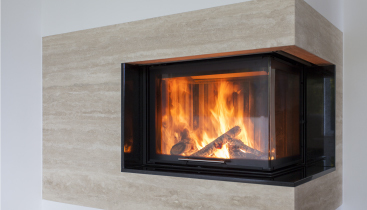 When choosing heating equipment, RUUD furnaces improve their ef ciency with a blanket of insulation lining the cabinet walls, electronic ignition, a controlled draft inducer blower and a secondary heat exchanger. RUUD heating equipment is held to high standards using the government AFUE (Annual Fuel Utilization Ef ciency) rating. The higher the rating is, the more ef cient the equipment. RUUD furnaces AFUE ratings range from 80 to 97 per cent. If you have a furnace manufactured prior to 1992, your AFUE is likely only 60 per cent. 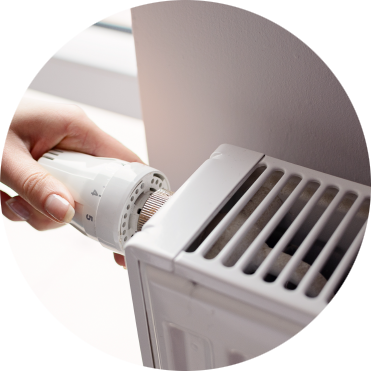 Heating and cooling equipment play a key role in your home energy expenses for years to come. Choose carefully. RUUD equipment is energy saving, cost effective, reliable and can enhance the bottom line of your home. Delta Temp2O technology helps prevent water temperature surprises. An easy-to-read LED digital display and background color indicator make it clear when the temperature is safe for you and your family. The background color displays blue if the water temperature is below 80 degrees, magenta if it is 80 to 110 degrees, and if the water temperature is greater than 110 degrees, the color display is red. Temp2O faucets come in many of Delta’s popular designs and finishes. They are Water Sense efficient, have up to six spray patterns, touch clean spray holes and a lifetime faucet and finish warranty to the original consumer. 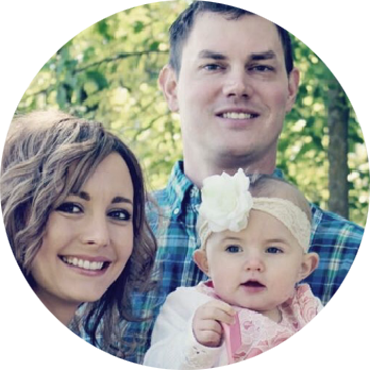 “For Your Family’s Comfort,” give Modern Heating and Plumbing a call at 218-847- 7459. 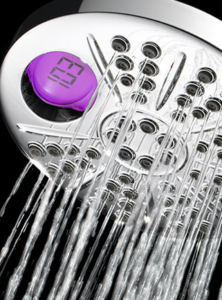 Beginning April 2015, the National Appliance Energy Conservation Act (NAECA) is making significant updates to water heater energy requirements. They are requiring higher energy factor ratings for virtually all residential gas and electric water heaters. This will reduce energy usage and save homeowners dollars. With the new guidelines, some homeowners will save as much as $365 a year. In most cases, the new water heaters will fit in existing spaces, however; because there is more insulation the new mandated water heaters will be approximately two inches wider and two inches taller. Because of tight areas, some homeowners may need to move their new water heater to a different location. Also, high-efficient gas water heaters require a drain nearby to dump condensation. No matter how we look at these new mandates, a challenge, an inconvenience or a worthwhile ruling…it’s going to happen, so we need to embrace it. For a new water heater installation or information on the new energy requirements, give us a call at 218-847-7459. WaterFurnace geo-thermal systems are among the most efficient, energy-saving, environmentally conscious heat pumps you can purchase. By installing a WaterFurnace system you can reduce your carbon footprint and utility bills at the same time! A WaterFurnace geo-thermal system uses the free, renewable energy found in your own back yard…save up to 70% on your heating, cooling and water heating bills. WaterFurnace geo-thermal systems meet the Energy Star requirements so there is a one-time tax credit of 30% of the installed cost! This tax credit remains in effect until 2016…making a WaterFurnace geo-thermal system an extremely wise buy! Let these extra savings keep you comfortable and put a smile on your face! “For Your Family’s Comfort,” give us a call for comfort and savings! Modern Heating and Plumbing 218-847-7459. Q: Why should I install a humidifier in my home? A: The simple answer is to increase comfort and savings! 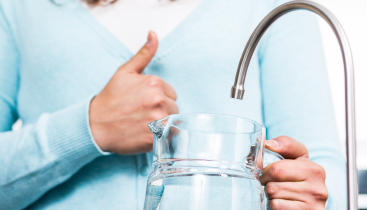 Your home is a lot like your body…it needs to stay properly hydrated in order to maintain the health and comfort of those living in it. Air that is too dry can act like a giant sponge, soaking moisture from everything…wood floors, pianos, furnishings…not to mention causing dry skin, chapped lips and static electricity. Humidifiers can help introduce moisture into your home, helping you reach the appropriate humidity level. This not only increases comfort, but can also reduce heating bills because humidified air feels warmer so you’ll be able to lower the setting on your thermostat, saving energy. No doubt about it, dry air takes a toll on your family, your home and your pocketbook! “For Your Family’s Comfort,” give us a call to have a humidifier installed to hydrate your home!